Get to know this cute vacation home, situated in the Maremma. This relatively unknown area of Tuscany offers loads of opportunities for an active and cultural vacation! This villa is fully furnished. A large well appointed garden with private swimming pool is at your disposal. The pool has a gorgeous panoramic view of the Val d'Orcia. On the covered terrace you can enjoy a cold beverage or start reading that new book. The available BBQ (stone) and pizza oven are the perfect tools to organize a culinary evening. A nice end to the day! During the daytime you can explore the beautiful surroundings. 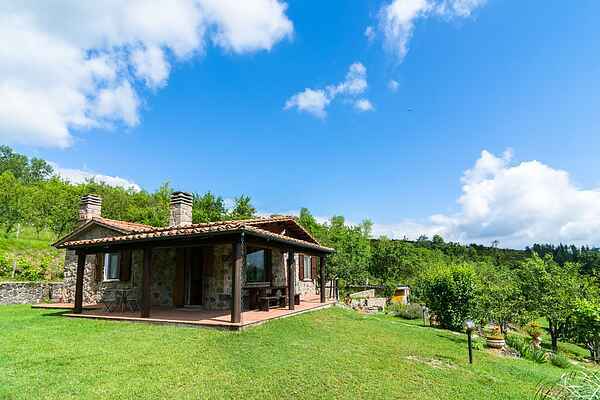 You can take a lovely walk in the wooded area around the Monte Amiata (1738 m. high), where you will find Casa Mezzavia. The Monte Amiata is a dormant volcano, therefore the surrounding area is very fertile. About 8 km away you will find Bagni San Filippo with its hot thermal baths and travertine rocks. Grocery shopping can be done in Abbadia San Salvatore (3 km.) In Radicofani (20 km) you can visit the beautifully situated fort from the 13th century. Do sit in the courtyard which offers a splendid view onto the Monte Amiata.